Here are the most popular posts of August 2011. Catch up here or see what all the fuss was about. David Prowse, the original Darth Vader actor, is still banned from official Star Wars conventions. The fans are still outraged. Beautiful bald women and the men that love them. Last month we had an incredibly successful contest. We'll probably do something like this again. You have to read the gut-busting comments people left. 'Cuz ssuperheros have to drive too. Here's how they roll. What's better than Slave Leia cosplay girls? Several Slave Leia cosplay girls. This post dropped in popularity three spots. If you're looking to customize your computer with Star Trek stuff, then you gotta check this out. 4. Do These Pics of Oliva Munn Prove She's Hot? For some reason this post has jumped five places! But, then, who doesn't love Olivia Munn? Recently, there's been news that The Wolverine sequel has been delayed again. Thank goodness. Read this post to see why. This moved up one spot. It's still great to know there's a life-size Speeder Bike out there. Check out our chart of the most expensive terribly awful science-fiction and superhero films ever made. Amazingly, Waterworld made the list. 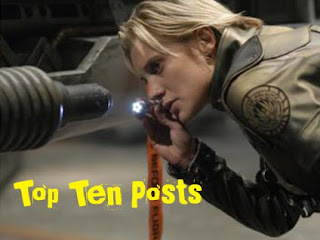 What do you think about the tope ten posts last month? Are you surprised any made the list?